Crushed peas make a rich, satisfying purée which, infused with garlic and Parmesan, partners meat beautifully. You can make this dish using frozen petits pois instead of fresh peas, which makes it even quicker. Heat a large griddle pan or non-stick frying pan over a medium heat and oil lightly. When hot, cook the chicken breasts, turning occasionally, for about 20 minutes or until golden on the outside and completely cooked through. You could grill or bake them if you prefer. Meanwhile, bring a pan of salted water to the boil, add the peas and, once the water comes back to a rolling boil, check that the peas are tender, then remove from the heat and drain (use some of this hot water to make up the vegetable stock if you are using granules or a cube). Tip the hot peas into a blender, add the stock, Parmesan and garlic and process to a chunky purée. Season to taste. Stack the basil leaves one on top of the other and roll up tightly. Slice very finely to create a chiffonade of basil. 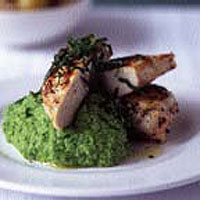 Serve the chicken breasts - either whole or sliced - on a bed of the bright-green pea purée. Scatter with the basil chiffonade, drizzle with extra virgin oil and sprinkle with lots of black pepper. Serve with boiled Jersey royal potatoes.